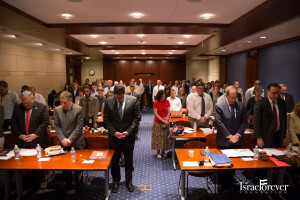 As Hamas rockets launched from Gaza were falling upon Israel, The July 9th Symposium convened at the United States Congress Capitol Visitors Center, held to assess the past ten years since the issuance of the International Court of Justice Advisory Opinion on Israel’s Terrorism Prevention Security Fence. It is all too easy to forget or push aside the essential reason for the construction of the security fence: to keep out the terrorists and to defend and protect the people of Israel. Ambassador Ron Dermer, Israel’s Ambassador to the United States and former top advisor to Israeli Prime Minister Benjamin Netanyahu, delivered the Keynote Remarks to the Symposium. He plainly stated that the millions of Israelis taking shelter in safe rooms in Israel was the equivalent of over 200 million people seeking refuge in bomb shelters in the United States. He pointed out that bombs over Tel Aviv and Jerusalem, Israel’s major cities, is like bombs over New York and Washington. Moreover, neither the United States nor any other country in the world would tolerate such attacks upon its sovereignty and its people … nor should they. The International Court of Justice Advisory Opinion pretends to take away from Israel the right to defend her people. Yet, the primary obligation of every nation-state is to protect and defend her citizens, which is both the right, and the obligation, of each country. US Ambassador to the UN Human Rights Council, Ambassador Keith Harper, delivered informal remarks to the Symposium, making it clear that it is the position of the United States that the focus at the UN Human Rights Council must be on worldwide human rights violations, on the many perpetrators of wrongful acts, and that it is a miscarriage of justice for the Council to focus more on Israel than on all other nations in the world. Professor Irwin Cotler, a Member of the Canadian Parliament and former Justice Minister and Attorney General of Canada, made it clear to the Symposium that the world uses the assertion of human rights and universal values as a camouflage, a masking, a laundering of the wrongful accusations against Israel that she is an apartheid, racist criminal state. Moreover, that the attacks upon Israel began long before the construction of the security fence; they began long before the establishment of the State of Israel. 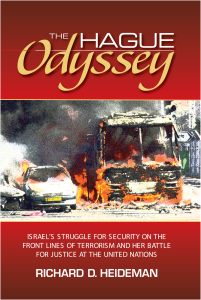 Israel’s enemies have attempted to deny her statehood, her existence, her rights as a nation-state and member-state of the United Nations in multiple venues and at every available opportunity, including threatening Israel with war, with verbal assaults, with resolutions and more recently with boycotts and accusations. Frederick Lawrence, President of Brandeis University, in addressing the Symposium, pointed out the comparative distinctions between the dissenting opinion of Hon Thomas Buergenthal, former Judge at the International Court of Justice and that of Justice Aharon Barak of Israel’s Supreme Court, further highlighting Israel’s respect for the rule of law and commitment to the due process rights of those aggrieved by the construction of the security fence. Indeed, Israel’s High Court rendered an opinion mandating relocation of the security fence, and did so prior to the Advisory Opinion of the International Court of Justice, which totally ignored the decision of Israel’s highest court. President Lawrence further addressed the issues of freedom of speech on college campuses in the context of growing anti-Semitism and anti-Israel attitudes on the college campus. William Daroff, Vice President of Jewish Federations of North America and head of the JFNA Washington public policy office, addressed the assault on Israel’s legitimacy in activities and actions ranging from boycotts, divestment and sanctions to increasing attacks upon Israel’s standing, particularly when viewed in the multi-decades long assaults upon Israel not only at the United Nations but in the court of public opinion. Kenneth Marcus, President and General Counsel of the Brandeis Center for Human Rights Under Law, delivered remarks addressing the challenges faced by Israel and the Jewish people on the college campus, urging those assembled to take action in speaking out against each incident so they not go unnoticed, unreported and unaddressed. Sarah Stern, President of EMET, outlined her case for the need and obligation of each person to stand up for Israel, speak out for the victims, and tell the truth about the maligning of Israel’s good name, making it clear that attacks upon Israel are indeed attacks upon the Jewish people wherever they may live. David Michaels, Director of United Nations Affairs for B’nai B’rith International, explained the long standing adverse attitude faced by Israel at the United Nations since its establishment as a nation-state. Michaels recounted the various resolutions adopted year after year against Israel in the halls of the UN while also holding out some hope that Israel, the only nation-state in the world presently not permitted to sit on the UN Security Council, might indeed find itself more welcomed in the halls of the UN now that it has been accepted into the Wester European and Others Grouping at the UN. The July 9th Symposium, organized by this writer and Ariana Heideman of Starburst Communications, provided insight and information to the standing room only audience, including key staff of various Members of Congress, as to Israel’s battle for justice at the United Nations, stand against terrorism and commitment to protecting the people of Israel. Special thanks goes to each of the organizational sponsors of The July 9th Symposium: Jewish Federations of North America; B’nai B’rith International; Jewish Community Relations Council of Greater Washington; The Lawfare Project; Louis D. Brandeis Center for Human Rights Under Law; The Israel Forever Foundation; The Institute for Law and Policy at the Hebrew University Faculty of Law; EMET; the American Association of Jewish Lawyers and Jurists; and Heideman Nudelman & Kalik, P.C. *Richard D. Heideman is Senior Counsel of Heideman Nudelman & Kalik, P.C., which represents victims of terrorism and others whose human rights have been violated. Heideman is the author of The Hague Odyssey [insert full title]. Heideman may be contacted at rdheideman@hnklaw.com. Copyright © 2014 · Richard D. Heideman. All Rights Reserved.